Thousands of protesters have marched through the Serbian capital Belgrade for the eighth week running to demonstrate against the government of Aleksandar Vučić. 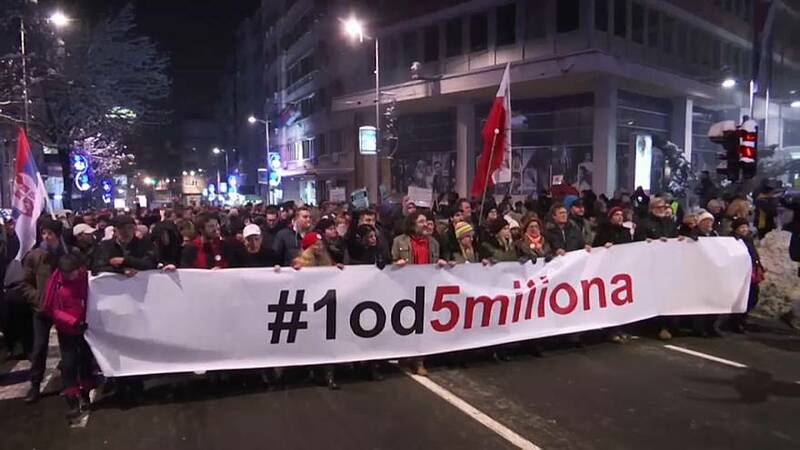 They taped up the doors of the state broadcaster and carried banners saying "one of five million" after Vučić previously argued that he would not give into criticism even if five million people objected. Protesters claim Vučić has restricted many of the democratic freedoms originally won during wars in the 1990s; a claim he vehemently denies. They rallied in freezing temperatures to block traffic in the city centre and march towards the government headquarters. They are urging Vučić to relax what they claim are tight controls on Serbian media. Aleksandar Vučić was a former nationalist but now hopes that Serbia will be able to join the European Union.